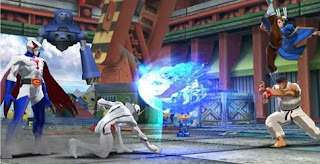 Capcom has confirmed the localization of Capcom vs Tatsunoko for the North American market via Twitter. However, since the story was broken based on Nintendo Power scans, it remains to be seen if the game will be multiplatform on PS3 and Xbox360, or simply limited to the Wii. Currently, this game is a Wii exlusive in Japan. I would get this game for my PS3 since that's where my tourney fightstick is; on Wii, I'm not so sure since that's the console I use for my room, and I use it mostly for single player games like No More Heroes, Resident Evils, Zelda, etc. As exciting as this news may be, I guess it's back to the Marvel vs. Capcom 2 train.